There are many ways to progress the difficulty of a squat, like by adding weight or chains to a barbell. But unilaterally loading the body, or emphasizing one leg at a time, makes the move harder, too—as does adding a plyometric or explosive aspect to the exercise. Try these three high-intensity variations. Each one adds at least one layer of complexity to the traditional movement. Squat Kick: Stand tall with your feet hip-width apart. Bend at the hips and knees to lower yourself into a bodyweight squat. 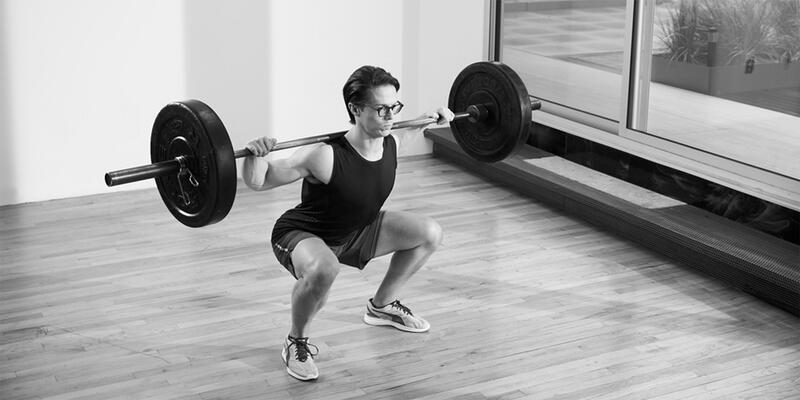 When you reach the bottom of the squat, immediately drive through your heels to reverse the movement and, as you return to standing, kick your right leg out in front of you, leading with your heel. Bring your right foot back to start, squat, and repeat with the left leg. That’s one rep. Do 3 sets of 10. Bulgarian Split Squat: Stand in front of lounge chair (or bench) with your feet hip-width apart, hands fisted under chin, and elbows by your sides. Place the ball of your right foot on top of lounge chair behind you, and then squat down, keeping your back tall and bending knees until your right knee taps ground; push through your heel to return to start. Perform 10 reps, then repeat on the opposite side. Do 3 sets. Curtsy Squat: Stand with your feet shoulder-width apart, hands fisted under chin, and elbows by your sides. Step your left leg behind your right leg, so the ball of the left foot lands in line with your right hip. Then squat down until your left knee almost touches the floor. Pause, then drive through your right foot to return to start. Repeat on the opposite side. That’s one rep. Do 3 sets of 10.